The product planners at Alfa Romeo decided to borrow naming technique from MG with the release of an executive sedan called the Alf Romeo Alfa 6 in 1979. It used the classic Alfa Romeo setup of a engine mated to a rear wheels that were suspended by a de Dion tube in the back, but it used a conventional gearbox instead of a transaxle like the Alfetta (Italian for little Alfa). Find this 1980 Alfa Romeo Alfa 6 Diesel here on eBay bidding for $2,501 with 1 day to go, located in Scarsdale, NY. The bix sedan was given the 6 suffix because it was the first car to use the legendary Giuseppe Busso designed Alfa Romeo V6. 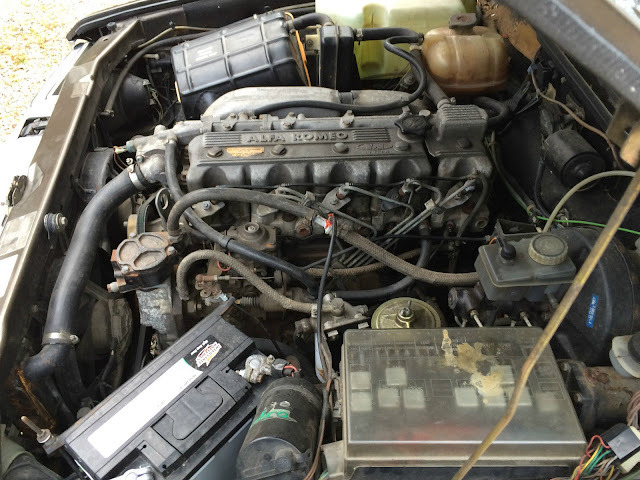 The V6 would eventually be used in the GTV, Alfetta, 164, 155, 75/Milano, but funny enough, this one does not have a sonorous V6! 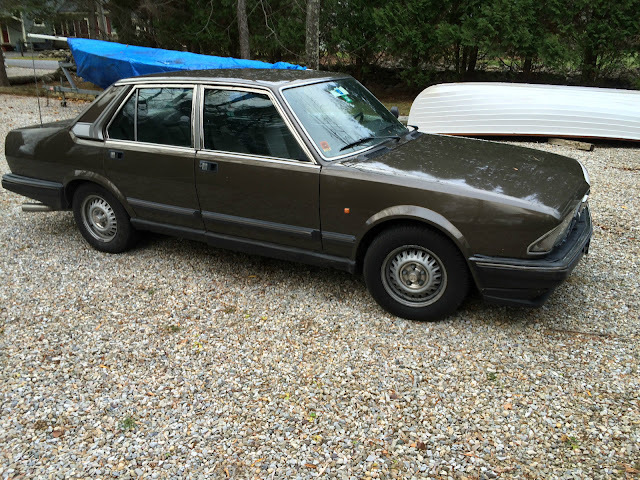 This bruciatore ad olio is one of the ~3000 Alfa 6s (should probably be called an Alfa 5) that were equipped with the optional inline-5 turbodiesel. The heavy fuel burner was engineered by VM Motori S.p.A (out of Cento, Italy, now part of Fiat) and puts out 105 horsepower and 152 ft-lbs of torque. 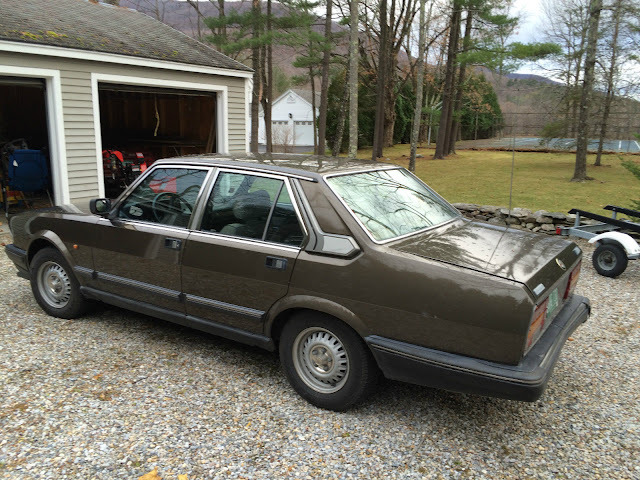 This 6 is equipped with the dogleg configured 5-speed -- apparently buyers had the choice of conventional and dog-leg 5-speed transmission options when new. The strange knob you see sticking out from the steering column under the turn signal stalk is a pneumatic headlight beam control system that should steer the headlights, and according to the Italian who runs alfa6.net, it never works. That Google Translate version of the headlight story is hilarious. It is much easier to read once you figure out that the name "Carello" (the venerable Italian headlight maker) apparently translates to "basket". Oh, and regarding this particular car, to me "Alfa" and "Diesel" go together about as well as "Porsche" and "SUV". 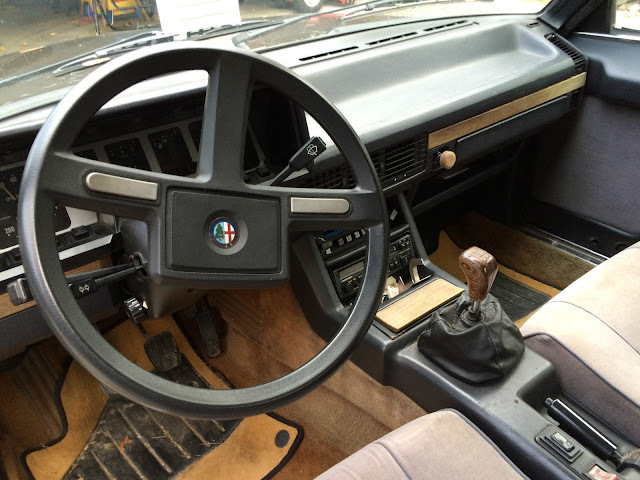 "The strange knob you see sticking out from the steering column " is whomever chose to buy this car with a diesel.... all of the Alfa problems with none of the performance. This seller has a terminal case of the Alfa affliction. Look at what lurks in the other two garage stalls. The photos must be at the vacation house in Vermont. VT plates, un-Scarsdale scenery and the fact he'd be ushered out of Scarsdale if this thing ever ended up in his driveway in that posh hamlet. Sold for $4850.00 - some other adventurer had to own it.